Credit: Tricia Kessler. Lieutenant General Ronald L. Bailey, USMC, (above right) will be the guest of honor. 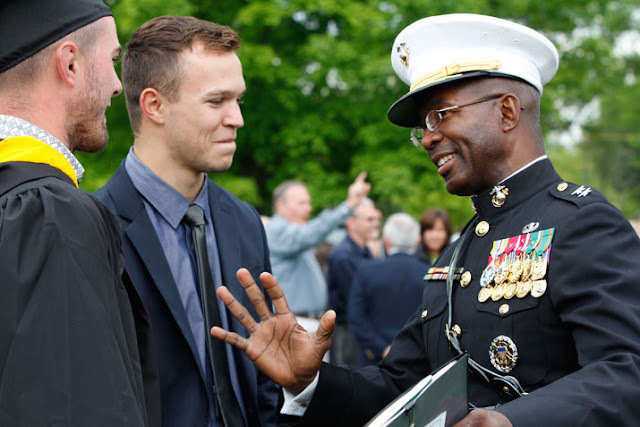 Lt. Gen. Bailey spoke at the University’s 2013 Commencement and also, serves on the University’s Board of Trustees. Delaware Valley University is holding its inaugural Military Service Day Saturday, Oct. 31 at Lipinski Field at James Work Stadium on its main campus in Doylestown. Before a home game against Lebanon Valley College, the University will be holding a ceremony to honor active duty, reservists, retired military and veterans. Lieutenant General Ronald Bailey, USMC (Deputy Commandant Plans, Policies, and Operations), will be the guest of honor and honorary co-captain for the day. Lt. Gen. Bailey is a member of the University’s Board of Trustees and spoke at the University’s 2013 Commencement. Stadium gates will open at 11 a.m. Please arrive at 12:45 p.m. for the pregame ceremony. The game will begin at 1 p.m. All are welcome to join in the fun and help cheer on the Aggies! Tickets: All active duty, reservists, retired military and veterans will be admitted to the home football game at no cost. Beginning on Monday, Oct. 26, tickets are available for pick up at the DelVal Athletics Office from 9:00 a.m. to 5:00 p.m. Tickets are available for pick up at the stadium Will Call window on game day starting at 11:00 a.m. General admission tickets are $6 for adults; $3 for senior citizens and $3 for non-DelVal students. Children age 10 and younger will be admitted at no cost. Directions and Parking: The University is located at 700 East Butler Avenue, Doylestown, Pennsylvania, 18901. Stadium gates open at 11:00 a.m. Please arrive at 12:45 p.m. for the pre-game ceremony. The game will begin at 1 p.m. Parking is available at no cost in Lot A, adjacent to the James Work Memorial Stadium.